For the theatrical equipment, see Footlight. Cambridge University Footlights Dramatic Club, commonly referred to simply as the Footlights, is an amateur theatrical club in Cambridge, England, founded in 1883 and run by the students of Cambridge University. The ADC Theatre is the home of the Footlights. Footlights' inaugural performance took place in June 1883. For some months before the name "Footlights" was chosen, the group had performed to local audiences in the Cambridge area (once, with a cricket match included, at the "pauper lunatic asylum"). 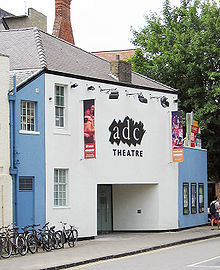 They wished to go wider than the University Amateur Dramatic Club (ADC), founded in 1855, with its membership drawn largely from Trinity College, and its theatre seating only 100. They were to perform every May Week at the Theatre Royal, the shows soon open to the public. A local paper commended the Club's appeal to the "general public, the many different classes of which life in Cambridge is made up". The club grew in prominence in the 1960s as a hotbed of comedy and satire, and established a permanent home in the basement of the Cambridge Union. Having established a tradition of performing at the annual Edinburgh Fringe Festival, the club entered the mainstream when its members formed half of Beyond the Fringe, the hugely popular stage revue which toured Britain and America in 1960. The 1963 revue then followed in the footsteps of Beyond the Fringe, appearing in Edinburgh and London's West End, before travelling to New Zealand and the United States, where it made appearances on Broadway and The Ed Sullivan Show and received a full-page review in Time. The first woman to be given full membership was Germaine Greer. She joined in October 1964 on the same day as Clive James and Russell Davies. There had been women before that time who had been allowed to join in, including Eleanor Bron in the late 1950s, but Greer was the first to be billed as a full member. Apparently Tim Brooke-Taylor was instrumental in having women admitted. She was part of the Footlights' 1965 revue My Girl Herbert. Over the next decade, Footlights members came to dominate British comedy, creating and starring in shows such as Not Only... But Also, I'm Sorry, I'll Read That Again, At Last the 1948 Show and That Was the Week That Was, forming comedy groups such as Monty Python and The Goodies, and generally fuelling the satire boom. During the 1980s, Footlights reinforced its position at the heart of British comedy. The 1981 revue, featuring Emma Thompson, Hugh Laurie, Stephen Fry, Tony Slattery, Penny Dwyer and Paul Shearer, won the inaugural Perrier Award at the Edinburgh Fringe Festival and spawned Fry and Laurie, the first in a long line of popular and successful double acts formed at the club. Their revue, The Cellar Tapes, at St Mary Street Hall was billed as "the annual revue: one of the strongest casts for several years, has already toured in southern England with great success." Many of its former members have gone on to win Oscars, BAFTAs and other awards and enjoy success in the entertainment and media industry. Today, Footlights is recognised as a finishing school for many of Britain's best-known comic entertainers. During term, Footlights produce the regular "Smokers"—an informal mixture of sketches and stand-up—at the ADC Theatre. The club also produces the annual Pantomime (in collaboration with CUADC) and the Spring Revue, as well as staging the winning entry of the Footlights Harry Porter Prize; a competition in which any student at the university may enter a one-hour comic play. The Footlights International Tour Show takes place from June until October, and travels to Cambridge, London, Edinburgh and venues across the USA. For information about individual Footlights revues, see Cambridge Footlights Revue. This is a list of former members of Footlights who achieved notability after graduating from Cambridge University. The elected leader of Cambridge University Footlights Dramatic Club is known as the president, who is assisted by a vice-president, treasurer, archivist and several other posts to form the committee. ^ a b "Footlights history". Footlights.org. Archived from the original on 22 September 2013. Retrieved 16 September 2013. ^ "Pete & Clive", BBC Radio 4, 9 November 2015, from 00:06:43. ^ a b Wallace, Christine (1999). Germaine Greer: Untamed Shrew. London: Faber and Faber. pp. 123–124. ^ Boston, Richard (3 June 1983). "From the archive, 3 June 1983: Cambridge Footlights celebrate 100 years of comedy", The Guardian. ^ Hewison, Robert (1983). Footlights! – A Hundred Years of Cambridge Comedy. Foreword by Eric Idle. Methuen London Ltd. ISBN 978-0-413-51150-8. ^ From Fringe to Flying Circus – 'Celebrating a Unique Generation of Comedy 1960–1980' – Roger Wilmut, Eyre Methuen Ltd, 1980. ^ The Broadway League. "Cambridge Circus". Internet Broadway Database. Retrieved 16 September 2013. ^ "Talents who sparkled in comedy's Hall of Fame". BBC News. 24 August 1998. Retrieved 11 March 2016. ^ "Why Footlights is a breeding ground for double acts". BBC News. 6 December 2010. ^ "The South Bank Show: The Cambridge Footlights". University of Cambridge. 30 January 2009. ^ "The Cambridge Footlights: First steps into comedy". The Independent. 28 January 2009. ^ Venables, Ben (22 July 2017). "The Edinburgh Fringe, or The Great Big Comedy Takeover". Fest. Retrieved 13 October 2017. ^ "Emma Thompson". All Media Guide / Rovi via The New York Times. Retrieved 12 October 2013.